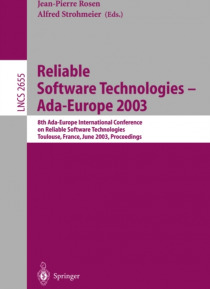 The8thInternationalConferenceonReliableSoftwareTechnologies,Ada-Europe 2003,tookplaceinToulouse,France,June18-20,2003.ItwassponsoredbyAda- Europe, the European federation of national Ada societies, and Ada-France, in cooperation with ACM SIGAda. It was organized by members of Adalog, CS, UPS/IRIT and ONERA. Toulouse was certainly a very appropriate place for this conference. As the heart of the Eu… ropean aeronautic and space industry, it is a place where so- ware development leaves no place for failure. In the end, reliability is a matter of human skills. But these skills build upon methods, tools, components and c- trolled practices. By exposing the latest advances in these areas, the conference contributed to ful?lling the needs of a very demanding industry. As in past years, the conference comprised a three-day technical program, during which the papers contained in these proceedings were presented, along with vendor presentations. The technical program was bracketed by two tutorial days, when attendees had the opportunity to catch up on a variety of topics related to the ?eld, at both introductory and advanced levels. On Friday, a workshopon"e;QualityofServiceinComponent-BasedSoftwareEngineering"e;was held. Further, the conference was accompanied by an exhibition where vendors presented their reliability-related products.